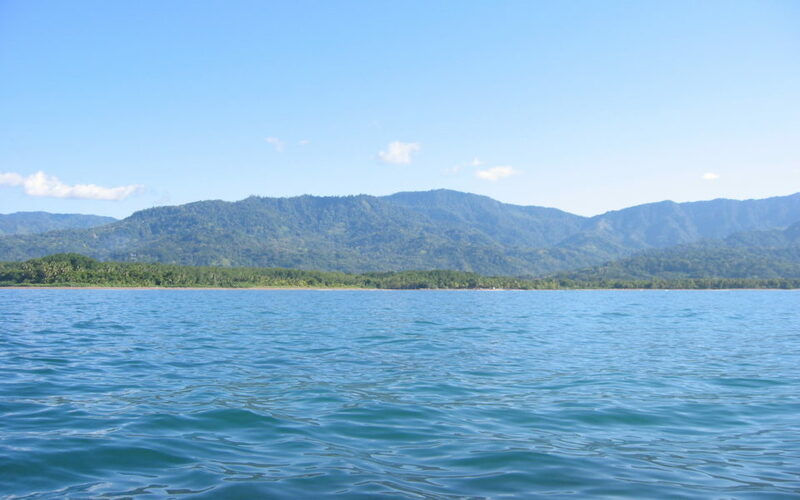 Dominical is a 3 to 3.5-hour direct drive from the capital city of San José. We recommend you take off early and see the sights along the way. First, from wherever you are in the Central Valley, make your way to Highway 27. Be prepared to pay for tolls along this road, about 400 to 600 colones each, they will take small bills in USD as well. After the toll in Orotina, look for the Jacó/Tárcoles exit towards Highway 34. This coastal road, known in Spanish as the “Costanera” will lead you all the way down the coast past the towns of Jaco and Quepos until you arrive in Dominical. When going past Orotina, check out the multiple fruit stands along the way and shop for tropical goodies as well as locally made snacks. Stop at the bridge over the Tarcoles River, and look down to see the largest population of crocodiles in Costa Rica. Additionally, you are also entering Macaw country, so keep a look out for their bright colors flying overhead, in romantic sets of two. Notably, both the towns of Herradura and Quepos boast Marinas featuring high end restaurants, shopping and lovely views of the ocean. Your scenic tour will take you past several palm plantations after the town of Quepos, and then past the Baru River Bridge. Take a short left right after crossing this river and Hotel DiuWak awaits about 300 meters from the main road. If you are in the province of Cartago, a scenic route to take is over the Cerro de La Muerte, through to the town of San Isidro and down to the coast to Dominical. This drive can also take 3-3.5 hours without any stops. If you leave early in the morning you will avoid the fog and rain which is frequent on this road, and you will also be able to take the time to stop and enjoy the sights. Have breakfast at the famous Chespiritos restaurant along the way, take a walk in the cloud forests close to the top and breathe in the cool, crisp air and shop for delicious Dota coffee harvested in the valley of the same name. When you reach the bustling town of San Isidro, Perez Zeledon, have a meal or do some last-minute shopping. You are a bit over an hour from Dominical now, so just head to Route 243 all the way down to the coast where you will come up to the Baru River Bridge. Ultimately, cross the bridge and a turn left and Hotel DiuWak is a short 300 meters away. 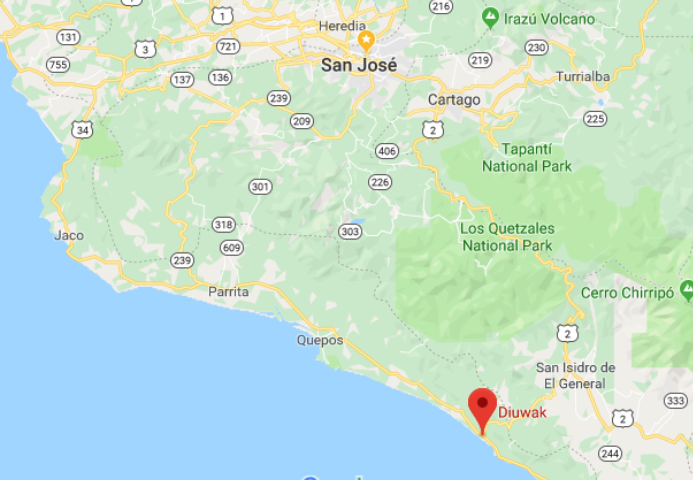 Alternatively, a local flight from San José to Quepos takes about 25 minutes, and from there the “Costanera” road will take you to Dominical in about 50 minutes. The town of Dominical attracts surfers for its powerful waves and laid down vibe. Additionally, the coastline offers much to see and do apart from hitting the waves. Travel north for about 50 minutes and visit the most popular National Park in Costa Rica, Manuel Antonio. Head south for about 15 minutes and the town of Uvita is the taking off point for whale watching, snorkeling, enjoy sports fishing and other seaside adventures. Not all fun is to be had along the coast. Head inland and explore the rivers and waterfalls that flow in the hills close to Dominical beach. Nauyaca Falls is probably the best known, its impressive layers of cascading water offer the perfect opportunity for a refreshing dip. Visit our front desk and ask about all the tours in the area to complement your stay with us.